Robert Shiller predicted the housing crash. He predicted the 1987 stock market crash. And many people (myself included) find his analysis of SP500 earnings and valuation to be the best available method of predicting future returns. Instead of relying on last year or next year's earnings, which could be high (peak margins that may revert) or low (restructuring, massive recession), he uses a 10year average PE ratio. Using his measure, the SP500 is trading at a multiple of 15. The average from 2000-2008 was 28.2, so the SP500 would appear to be greatly undervalued. However that's the thinking that led people to plow into the market in 2008, only to lose more money as stocks were "revalued" at ever lower PE multiples on ever-dropping earnings. So the question to me is, do we bottom out at "hat-size" multiples in the 7-9 range, as happened in 1971 and 1981? Looking at the data (http://www.econ.yale.edu/~shiller/data.htm), I think the answer is no. The main reason stocks sold for single-digit PE's from 1974-1984 was because the 10year US treasury yielded about 10% (on average) during that time. Earnings were growing, but attractiveness of risky stock assets wasn't enough to outweigh the huge yields in bonds. Jump to today. First of all bond yields are mini, with the 10year yielding 3.25%. I'm not inclined to simply say that low yields on treasuries means throw more money at risky assets. More interesting is the underlying earnings figure used by Shiller, which was most recently at 14.88, down 82% from a peak of 84. When the SP500 sported a tiny 6.6 PE in 1982, earnings had only dropped 6% from their peak. Just as peak earnings are unsustainable, the severity of earnings declines will be also - and the market will likely bottom closer to a low teens multiple than a single digit one. Without being able to pick the ultimate bottom, our best bet is to know what's most likely in store. For that, check out this chart from Prieur de Plessis. 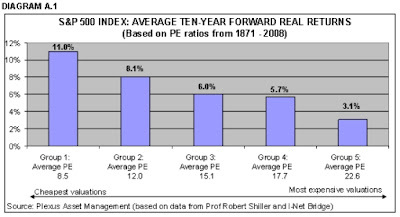 It shows what the average forward returns have been based upon the Shiller "PE10" discussed above. The lower the PE at the time of purchase, the better the forward returns. Currently we're looking at maybe 7% going forward. Disclosure - short exposure to the sp500, using SDS. Purely a trade, purely short term.